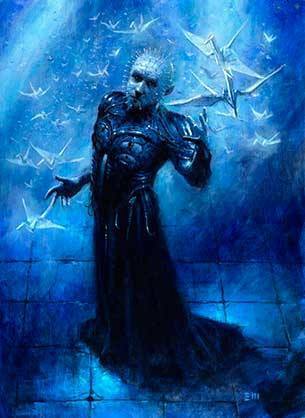 The Scarlet Gospels is Clive Barker's literary shank to the Hollywood film franchise that tarnished the Hellraiser mythology. The premise was simple: solve a puzzle box and summon a hedonistic tribe of demonic nasties that guide you to a new dimension of pleasure and pain. What could possibly go wrong? After the second film the plots were so absurd even our beloved Hell Priest would pluck the nails from his scarified head and plunge them into his eyeballs like a pin cushion if he was ever subjected to a movie marathon. You don't need to be familiar with The Hellbound Heart novella, or the films, to appreciate Barker's ambitious attempt to reclaim his horror icon. There are, however, plenty of references to satisfy the fans. So, is it worth reading? Hell yes. How does it compare to his other novels? Yeah … Let's discuss. First of all: The Scarlet Gospels had been in the pipeline for years. Details emerged on Barker's website that threatened Pinhead's sweet, sweet demise. And if that wasn't great enough Barker decided to indulge in a cross-over event by throwing another classic individual into the mix. The Great and Secret Show featured occult detective Harry D'Amour—a man drawn to paranormal phenomena (similar to Harry Dresden) and covered in new age tattoos (wards, like John Constantine). Our seasoned protagonist would be baited by his nemesis to chase him throughout Hell. The original draft was over 300,000 words and almost everything that was hinted at in the early days has been edited out or tweaked to convey something different to what we were expecting. The final cut is a third of the original draft. Rumour has it that one thread was woven into Abarat's tapestry first so it needed to be plucked. The Scarlet Gospels prologue is incredible. Just Wow. The opening chapters dive straight into goretastic action where the surviving members of a magical secret society resurrect one of Pinhead's victims with the hope of gaining valuable insight to wage war against the demon. The situation is dire and you feel the tension as these poor souls realise their schemes are futile and they begrudgingly accept their imminent evisceration by hooks and chains. What makes the beginning of the story so grand is how creative and efficient Barker is with introducing the villain while establishing a rich backstory with characters arguably more interesting than the core ensemble cast we meet later on. One major criticism: some intriguing elements that are seeded at the start of the novel (one in particular) does not pay off later. This text has one too many loose threads, unlike Coldheart Canyon, which is a shame. For a swansong I expected more closure. While a rogue demon is slaughtering folk around the globe we meet Harry D'Amour and his blind medium friend, Norma Paine. Overt foreshadowing and exposition forces the narrative down a contrived path. Even the supporting cast, the harrowers, seem as though they've been thrown in purely for comedic relief and to give the point-of-view characters someone to talk to. Poor characterisation of minor players lets The Scarlet Gospels down. Sure, there are some interesting moments with these people but it really felt like they were all being dragged around out of convenience for the plot to move forward. These individuals lacked agency. Maybe a lack of agency was the point? After I finished reading the novel I found myself conflicted in regards to my thoughts on how everyone behaved. Is this my subjective bias chipping in or are the overarching themes of the novel working my mind into serious philosophical contemplation? 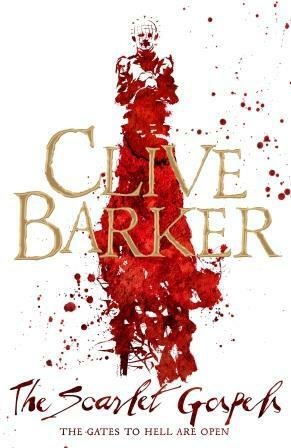 Barker's poetic voice soars throughout The Scarlet Gospels. He's still got it. The prose is musical. Dialogue flows like rivulets of blood dripping from one of Hell Priest's macabre tableaus. The pronunciation of invented words and sounding out the incantations in the text were a delight. I often re-read entire passages just to enjoy the intricacies of the language. The last Barker novel that did this for me was Abarat. Equally profound was the physical journey of traipsing through what seemed to be the end of a golden era for a Rome-like Hell—superb imagery that lingers in your mind of alien architecture, bizarre beings and an alternative civilisation that defies the lazy fire and brimstone stereotypes. Exploring Hell as a place rather than a concept was thrilling. I thoroughly enjoyed one of the big clashes towards the end of the novel between Pinhead and one of his rivals. The soliloquys were brilliant and set the tone of the situation and the grandness of it all. By the time you finish The Scarlet Gospels you realise that it's all about Hell Priest and his ambitions. Everyone else is just spectating and their fates are somewhat negligible, which resulted in a somewhat anticlimactic ending. On the surface the narrative is lacklustre. If you let the text hook you with its themes and imagery then Pinhead truly does have such sights to show you. If you are a fan of dark fantasy I recommend Weaveworld.